Not only was Sunday’s Indy Grand Prix of Alabama soaked—so were James Hinchcliffe’s pants. While the weather forced a red flag, the IndyCar driver talked to NBCSN and wove a captivating tale of why yesterday was the first time he was ever forced to piss in his racing suit. I was sitting there during that first red, and I was begging to get just three minutes. That’s all I need. Three minutes, wheel off to wheel on. And when we got going again, my legs were shaking. I had to go so bad. I’m like, I can’t drive a race car like this. So, under caution, it took me a full lap. It was one of the least comfortable experiences of my entire life. 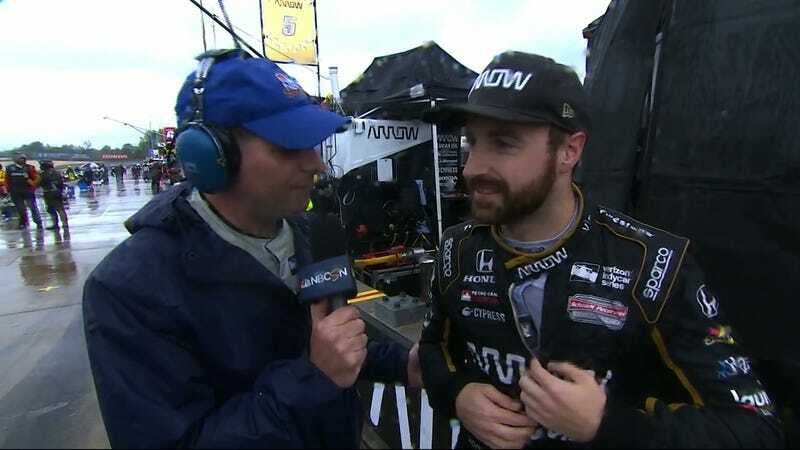 “I can officially say I’ve joined the likes of Will Power and Dario Franchitti and other greats that have peed themselves in their suits,” Hinchcliffe said. “So you’re talking to a man that just wet himself.” He’s just drenched in greatness.